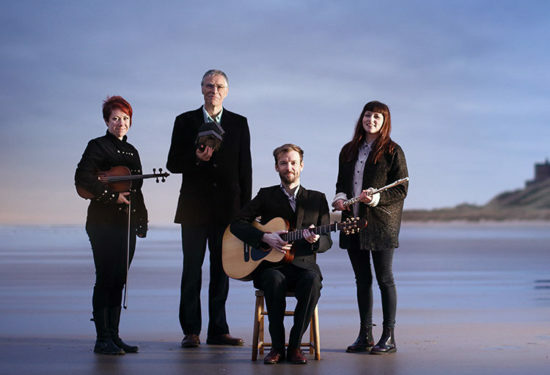 Alistair Anderson & Northlands embark on a short North East tour from 12 – 15 July and alongside them will be the sparkling youth folk ensemble Folkestra. They visit Morpeth, Washington, Barnard Castle and Gateshead, performing public evening concerts and visiting schools during several of the day times. The tour, organised by Sage Gateshead, is part of the Heritage Lottery funded Folkworks project ‘Pass it On – The Tradition in Your Hands’. The project helps to demonstrate that folk music, song, dance and storytelling is a living tradition, passed on from one generation to the next. The Pass it On Tour shows this on several levels. Alistair’s band Northlands is himself, as the perhaps’older statesman’, with 3 younger musicians, Sarah Hayes, Sophy Ball and Ian Stephenson, all of whom were enthused by folk and traditional music in their teens – and where Folkworks Summer Schools, created by Alistair as then Artistic Director of Folkworks, played a huge role during their teenage years. While Sarah studied music at the Glasgow Conservatoire, Ian and Sophy went on to study on the Newcastle University Folk and Traditional Music Degree – which was co-founded by Folkworks and Newcastle University, with Alistair as the driving force in its inception. Ian, Sophy and Sarah have all been tutors on the Folkworks Summer Schools, taking their turn to inspire a further generation. Ian is also artistic director of Folkestra, Sage Gateshead’s highly talented group of young traditional musicians all aged under 18 – and this forming the 3rd generation of the touring party. By taking this tour line-up into schools, pupils will see not only folk music of their own region at its absolute best, they will also have the experience of seeing young people of around their own ages, performing and loving the music. Band members know from experience that this can inspire a life-long love of the music. Ian, Sophy and Sarah were part of Folkworks or other projects in their teens, performing concerts in schools and festivals, and know some of their contemporaries are now working in folk music as a result of hearing Northumbrian rants, jigs and reels in their school hall! All audiences can expect a concert of wonderful traditional tunes and songs from the collections and living memories of North East tradition will being brought to life – demonstrating another way in which the music is passed on! Each concert will feature Folkestra opening the show followed by a longer performance from Alistair Anderson & Northlands – and possibly some musical surprises between all the players! It promises to be really special. Do see it if you can.